The differences in terms of price, selection and delivery options once seemed obvious. That is no longer the case. You’ll spend $4 for a 28 ounce bottle of cleaner at Jet.com, while cleaners average $3 on Amazon. But, you need a $99 year-long Amazon Prime membership for those prices.If you’re interested in quick shipping on an ever-growing selection of brands and products, Amazon Prime is probably your best bet. But if you’re not willing to dish out the $99 membership fee, and instead want an easy alternative to stock up on household essentials, Jet.com and Uniquely J might be the better alternative. In another competition-heating move against Amazon and Whole Foods, Walmart-owned Jet.com recently launched an in-house collection of household essentials. But, what’s the difference between the two e-commerce giants? Uniquely J, Jet.com’s new private-label household brand, offers around 50 curated pantry essentials like coffee, cleaning supplies, laundry, pantry goods, paper products, and food storage, with more categories to come. But, are Uniquely J’s prices competitive? It depends. For comparison, Uniquely J’s single-serve coffee cups are $20 for 42-count container, while Amazon’s best-selling Keurig k-cup set is $24 for 40-count. (Amazon’s in-house k-cup brand is currently sold out on the site). Yet, when it comes to their fragrance-free, all-purpose cleaner, Jet.com’s brand may not be measuring up to Amazon. You’ll spend $4 for a 28 ounce bottle of cleaner at Jet.com, while other natural, all-purpose cleaners (like Method and Seventh Generation) average about $3 on Amazon. But, keep in mind that you need a $99 year-long Amazon Prime membership for those prices. Shop Uniquely J Clean Living Foaming Bathroom Cleaner here, $4. But, when it comes to quality, this might be where Jet.com shines. The Uniquely J line, created to attract younger, millennial shoppers, focuses on environmentally friendly, well-designed products. The cleaning products are plant based, the coffee is composed of USDA-certified organic and fair trade beans, and they use only BPA-free plastic bags. Plus, the products are sold in creative, artist-designed packaging. 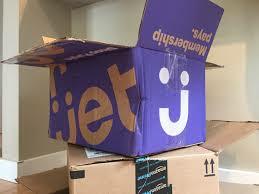 But, while Jet.com doesn’t provide free two-day shipping on all purchases like Amazon, it does offer free two-to-five-day shipping on orders over $35, with faster two-day shipping on thousands of essentials. However, to get free two-day shipping on any and all Amazon purchases, again, you need to be an Amazon Prime member. Bottom line, your shopping habits will probably best decide which retail giant is best for you and your family. If you’re interested in quick shipping on an ever-growing selection of brands and products, Amazon Prime is probably your best bet. But if you’re not willing to dish out the $99 membership fee, and instead want an easy alternative to stock up on household essentials, Jet.com and Uniquely J might be the better alternative. Either way, take a peek at the rest of Uniquely J’s brand new selection of home basics and discover the difference for yourself.